Robert Downey Jr. is convinced Chris Hemsworth has “parenting superpower”. 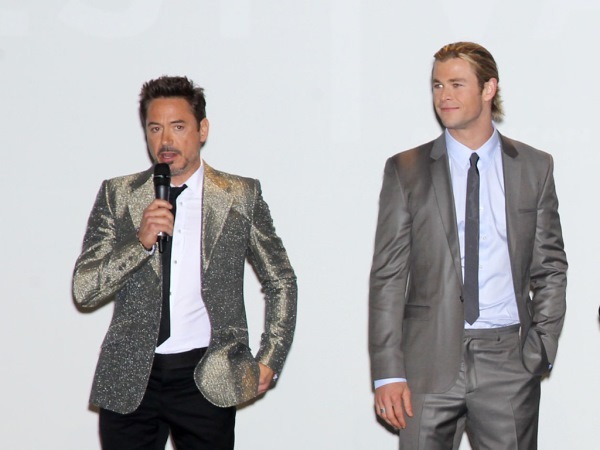 The Hollywood A-listers have been co-starring with each other in Marvel’s Avengers franchise films for several years now. And Robert believes Chris, who is parent to three children with wife Elsa Pataky, is one of the most remarkable fathers he’s ever seen. "I'm telling you his superpower is parenting," Robert told ET Online of his colleague. "I have never seen anything like it." Chris shares two-year-old daughter India and 12-month-old twin sons, Sasha and Tristan, with Elsa. And Robert admits he’s entertained while watching the family on-the-go. "[She’s] also the greatest, but just seeing them come out to a brunch with a twin strapped on each of them, I just look and I think 'They're young. That's how they can do that,'" Robert joked. Chris often invites his family to join him on set while he’s filming a movie. But when this scenario isn’t possible, the star admits it’s a challenge to be apart from them. "This film was the first time I didn't take my family with me and those weeks seemed like a lifetime now my daughter is two and a half," he sighed to British newspaper Metro about his experience shooting hacking film Blackhat, which was released in January. "My boys don't understand it yet but my daughter now says, 'Where is he? Where is Papa?' and that's heartbreaking. I don't want to do that very often and make a real effort not to."